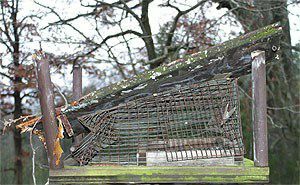 Here in the balmy Carolina Piedmont, it's rather unusual for us to get frozen precipitation, and when we do it seldom comes before Christmas. Our infamous ice storms--typically Old Man Winter's dying stab at us--often come as late as mid-March just as the first spring wildflowers are beginning to bloom. That's why our recent "late autumn" meteorological disaster of 4-5 December was a shocker, and why it caused so much damage at Hilton Pond Center and elsewhere in the Carolinas. There's a common misconception that when leaves die and change color in fall the trees immediately drop their foliage. That's true for some species, but certainly not all, especially where there isn't much wind. American Beech, for example, tends to hold its dead leaves until spring, while some common hardwoods-- Southern Red Oaks and White Oaks, in particular--lose leaves gradually as autumn turns to winter, much to the chagrin of obsessive lawn rakers. We've often speculated about the adaptive significance of retaining dead leaves but have never come up with a really good answer. Perhaps some trees gain a slight advantage by dropping their leaves in early spring, thereby smothering competitive species just as they are beginning to sprout. Or maybe it has to do with spreading fresh nutrients on the forest floor beneath the host tree. 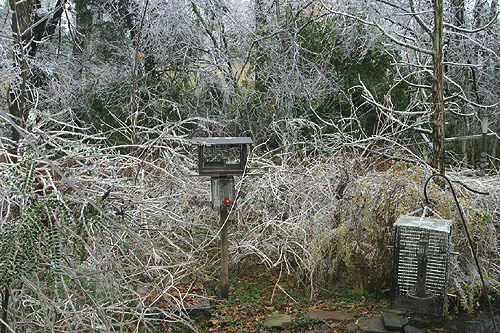 Regardless, any benefits of leaf-retention were significantly outweighed when the recent ice storm struck the Carolinas. 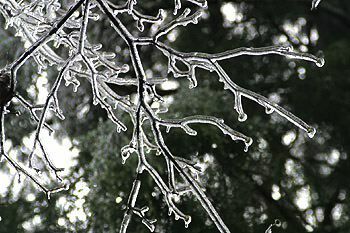 During our typical January-February-March ice event, freezing rain forms on twigs (Flowering Dogwood, top and above left) and on aerial lines, causing a few power outages. Trees most affected are pines and Eastern Red Cedars, whose evergreen foliage accumulates the ice. These trees bend and sometimes break--as was the case during our last major storm on 23 January 2000; often they rebound when the inevitable post-storm thaw occurs. In this week's catastrophe, however, it was leaf-holding oaks that were hard-hit as ice formed on their dead foliage and accumulated far more weight than branches and trunks could bear. During our 21 years at Hilton Pond Center, three weather events have caused significant damage. 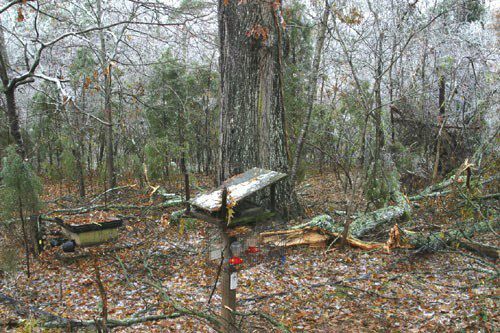 In 1989, the infamous Hurricane Hugo took down a couple of stately oaks and a towering hundred-year-old Eastern Red Cedar. Then the aforementioned January 2000 snow and ice event damaged some trees and required others to be cut to avoid damage to overhead power lines. The more recent December 2002 ice completely destroyed another of our cherished three-foot-diameter oaks (right)--as former farmland the Center doesn't have many large trees in the first place--but greater, widespread damage was done when large ice-laden limbs from mature oaks came crashing down to crush understory vegetation that normally is unaffected by ice deposits. Our closest call came from a huge Southern Red Oak that stands directly behind the old farmhouse and not far from our office window (below). This magnificent tree offers food or shelter to everything from Southern Flying Squirrels to Carolina Anoles to Red-shouldered Hawks and provides summer shade for the office and a highly productive line of mist nets we use year-round to catch birds for banding. 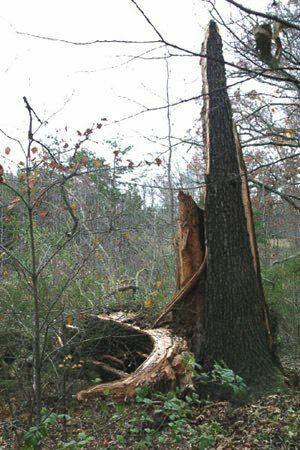 In the wee hours of the morning of 5 December, a sound like a gunshot signaled that this giant tree was about to lose a major horizontal limb a foot in diameter and 30 feet long! The branch snapped off and splintered as it fell, destroying two 50-year-old Flowering Dogwoods, flattening a hedgerow and a dozen or so small shrubs, shattering a water mister on a bird bath, ripping four mist nets, and collapsing a favorite pull-string trap (below right) we've been using for years to capture winter finches. The only good news was that the limb didn't fall on the farmhouse, and it missed our old hand-dug well. In the short-term, we're certain the loss of understory trees and shrubs will diminish the effectiveness of new mist nets we eventually deploy again beneath the big oak. Elsewhere around the property there is additional damage, although nothing as spectacular as that described above. Hundreds of limbs of various sizes block sections of our 2.5-mile trail network and will require considerable effort to remove. A couple of other mist nets and the poles that hold them are irreparably damaged; at $100 each, the six nets represent our greatest financial loss. Fortunately, nothing fell on our world-class Trumpet Creeper patch (below), so it should be in bloom and attracting Ruby-throated Hummingbirds starting about the middle of May. We're lucky in other ways, too, including that the Center was without power for only a few hours on 5 December--much better than post-Hugo when we waited eight days for electricity to be restored. This time around, our biggest inconvenience was not having phone or cable modem service for 72 hours, which made it impossible to communicate in the high-tech style to which we have become accustomed. In the aftermath of the Winter Storm of 4-5 December 2002, one big disappointment is having to think about all these fallen trees and limbs without doing much about them; our recent knee surgery makes it impossible to undertake any trail and repair work for another week or two. Thus, we'll just have to be content with gazing out the window at the mess at Hilton Pond Center--and with trying to figure out why any self-respecting Southern Red Oak would retain dead leaves and suffer such wrath from a freakish late-fall ice storm. You may wish to consult our Index of all nature topics covered since February 2000.